The British Champions Series has proven to be an important addition to flat racing since it was introduced in 2011. Many of the best horses across a number of different distances do battle in highly anticipated races throughout the season and it all comes to a head on British Champions Day at Ascot on Saturday. This is the highlight of the end of the flat racing season. Action over the jumps has already begun but we have one more chance to see the stars of the flat on British turf with five Group 1 or 2 races. It’s also a cracking day for punters which is why we’ve picked out the best of the betting below. The big news ahead of British Champions Day is the going at Ascot. The rain has really poured down in parts of Britain this week and the going at the Berkshire course is set to be soft, perhaps even heavy. That could cause problems for some of the most fancied horses and could lead to some winners at tasty prices. One of the main hopes of the season for John Gosden was that Stradivarius would kick on as a four-year-old and become the number one stayer on the flat. With four wins out of four, each at either Group 1 or Group 2 level, there’s no doubting that Stradivarius is the king of the stayers. However, he’d already announced himself as an excellent stayer ahead of last year’s British Champions Day and could only finish third in the Long Distance Cup on soft ground. Will he fall short again on similar ground 12 months on? While Stradivarius has never won on anything softer than good ground, Thomas Hobson has a perfect record of three wins from three flat races on soft ground. There are no questions about the stamina of Willie Mullins’ eight-year-old either as he gets ready to embark on another National Hunt season. Stradivarius remains the classiest option in the field but the ground concerns mean an each way bet on Thomas Hobson could be the most sensible option in the Long Distance Cup. Harry Angel went into the 2017 Sprint Stakes as the 5/4 favourite with the bookies. However, for one reason or another Clive Cox’s colt just doesn’t take to Ascot and things just did not pan out for him. It was Librisa Breeze who took advantage of the favourite’s problems. He put a luckless season behind him with a third win at Ascot and his owner, Tony Bloom, is quietly confident of another big win from the six-year-old 12 months on. Just like last year, Librisa Breeze’s incoming form is nothing to write home about but he’s saved many of his best performances for soft ground and is likely to find underfoot conditions are ideal at Ascot on Saturday. There’s no question that Librisa Breeze will need a much improved performance to have any chance but the going is a major concern for his main rivals – including the favourite, The Tin Man – so the 5/1 that BetVictor are quoting on his chances looks well worth taking. It’s been a pretty frustrating season for connections of Lah Ti Dar. The three-year-old had not raced when making her debut at Newbury in April but she justified her support in the market to win before trouncing the competition in a Listed race next time up at Newmarket. That raised expectation levels sky high but illness forced her out of lucrative races including the Oaks and Royal Ascot. John Gosden’s filly made her belated return in York when, once again she justified her favouritism over 1m4f. She went off as favourite again when contesting the St Leger where her stamina reserves just weren’t quite enough to see off the challenge of Kew Gardens. The performance at Doncaster was impressive enough given that 1m4f looks to be her ideal distance. Dropped back to that favourite trip, Lah Ti Dar can return to winning ways at 6/4 with Betfair to end the season in style. The £1,156,250 up for grabs in the Queen Elizabeth II Stakes makes this the richest mile long race in Europe. It’s also a hugely prestigious race, long considered to be Europe’s mile championship, and we have some quality horses with a chance of adding their name to a list of winners that includes Frankel, Solow and Rip Van Winkle. The incredible depth of the field for the 2018 Queen Elizabeth II Stakes makes this perhaps the most interesting and competitive race of the day from a betting perspective. Recoletos and Lord Glitters are contesting favouritism but it’s the in-form Laurens who really stands out at 6/1 with Ladbrokes. Laurens is the apple of owner, John Dance’s eye. So much so that he supplemented her for the race after impressing in a workout following her fourth Group 1 win of the year. Along with Laurens’ trainer, Karl Burke, Dance has settled on one mile being Laurens’ optimum distance. She’ll be happy with the sharper pace and has won with cut in the ground before so expect a big end to a wonderful season. Cracksman capped off a perfect three-year-old season with a win in last year’s Champion Stakes. John Gosden knew for a long time that he had a potential superstar on his hands and his hopes for even greater success as a four-year-old began well with his win in the Prix Ganay at Longchamp first time up in 2018. There were signs of the problems to come with his rather laboured performance when winning the Coronation Cup next time up and then came the defeat at Epsom when Poet’s Word took full advantage of a surprisingly lacklustre Cracksman performance. On his return, Cracksman will have to beat some high quality horses in the shape of Crystal Ocean and Roaring Lion but hopes are high that he’ll be back to his best when he returns to Ascot. Gosden has claimed that Cracksman simply wasn’t at the races last time out and there were suggestions he was paying too much interest in the fillies and mares he encountered at Ascot. Having worked on his focus at home, connections believe that Cracksman will be sharp and ready to go on Saturday. Back on the sort of heavier ground that he relishes, Cracksman should be too good for the competition so back him to win at 10/11 with Betfred. British Champions Day marks the climactic end of the flat racing season and in terms of top quality racing action, this Ascot meeting in October is hard to beat. With upwards of £4 million in prize money on offer over the course of the day, Champions Day is the most rewarding race day on the calendar and it is little wonder it attracts the very best runners, riders and trainers in the business. Champions Day serves as the denouement to the British Champions Series of races that takes place throughout the flat racing season. The five races we feature here are the finals of the five divisions. There is also a one mile handicap on the card, just to mix things up a little. As the name suggests, the Long Distance Cup is the test for the top stayers in the flat racing game. Run over a distance of around two miles, this Group 2 race is open to runners aged three or over and though the field can vary in number (six ran in 2018, 13 in 2017, 10 in 2016) it is always highly competitive, as indeed are all the races on the card. In 2018 the race had a purse of £500,000 with a cool £300,000 awarded to the victors. The race was given a new name and transferred to Ascot in 2011, previously having been run as the Jockey Club Cup at Newmarket, where it was inaugurated way back in 1873. In the pre-Ascot era, Irish-bred gelding Further Flight won this race five years in succession (1991-95), while the great Sir Gordon Richards rode to victory seven times between 1930 and 1949.
Notable races in the Long Distance category of the British Champions Series leading up to this race are the Yorkshire Cup, the Ascot Gold Cup, the Goodwood Cup and the St Leger. The Sprint Stakes is for the speed demons of flat racing and this six furlong dash is fast, frenetic and very exciting. Generally with 10 or more in the field (there were 14 runners in 2018, 12 in 2017, 13 in 2016) there have been some cracking races over the years. Upgraded to Group 1 status in 2015, it is open to runners aged three years and older and had a purse of over £600,000 in 2018. Previously known as the Diadem Stakes, the race was first run at Ascot in 1946, but its renaming and subsequent reclassification as a Group 1 race has really cemented its significance on the flat racing calendar. Lester Piggott was in the winning saddle seven times for this race between 1971 and 1983 (under its previous name). The top races in the Sprint category of the series are the King’s Stand Stakes and the Diamond Jubilee Stakes, both at Royal Ascot, and the Darley July Cup (Newmarket) and Sprint Cup (Haydock). This race gives the top females of flat racing the chance to show what they can do. Upgraded to Group 1 status in 2013, this middle distance race of a mile and half is open to fillies and mares aged three or older. The 2018 winner, Aidan O’Brien’s Magical, earned her connections the tidy sum of £340,000. This race started life at Ascot in 1946 as the Princess Royal Stakes before moving to Newmarket and being renamed the Pride Stakes before being returned to Ascot in 2011 when it was given its current name. Once again Lester Piggott is the jockey with the most wins with a total of eight victories between 1959 and 1984. Races in the Fillies and Mares category of the British Champions Series include two Classics, the 1,000 Guineas (Newmarket) and the Oaks (Epsom), as well as the Coronation Stakes at Royal Ascot. One of two races on British Champions Day to have a purse of over £1 million (£1,100,000 in 2018), the Queen Elizabeth II Stakes is one of the top mile events of the season. Open to runners aged three years and older, there have been some big name winners over the years, not least the inimitable Frankel in 2011. The Queen Elizabeth II Stakes was created in 1955 when the Knights’ Royal Stakes was renamed in honour of the Queen. It has held Group 1 status since 1987 and has long been considered one of the top mile events of the year. The Mile category of the British Champions Series boasts some cracking races including the 2,000 Guineas (Newmarket), the St James’s Palace Stakes (Royal Ascot) and the Lockinge Stakes (Newbury). The biggest race of the day in terms of purse (£1,300,000 in 2018) and many would say prestige, the Champion Stakes is the culmination of the Middle Distance category of the British Champions Series. Run over a distance of one mile and two furlongs, and open to runners aged three and older, this race is a true favourite with racing fans. Originally held at Newmarket, the race was inaugurated all the way back in 1877 and has been classified as a Group 1 race ever since the grading system was introduced in 1971. The legendary Frankel won this race in 2012, the year after he had been victorious in the Queen Elizabeth II Stakes. The ‘Wizard of Manton’ Alec Taylor Jr trained eight winners of this race between 1903 and 1925, while – at the time of writing – Tristan is the only horse to have won it three times (1882-84), though interestingly two of those were classified as dead heats. Some of the biggest flat races of the season take their place in the Middle Distance category of the British Champions Series, including the Derby (Epsom), the Prince of Wales’s Stakes (Royal Ascot) and the King George VI and Queen Elizabeth Stakes (Ascot). 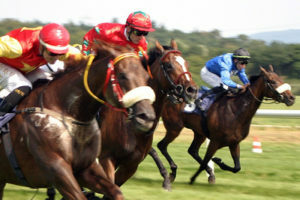 The British Champions Series itself, and its climax British Champions Day, were conceived of as a way to increase interest among racing fans in some of the key races of the flat racing season. The idea was to link races to others in their category, the five categories being Sprint, Mile, Middle Distance, Long Distance and Fillies & Mares. The series was first run in 2011 with the first British Champions Day meeting taking place at Ascot in October of that year. The meeting brings together some of the most historic season-closing races from Ascot and Newmarket. While the Champion Stakes (formerly at Newmarket) and the Queen Elizabeth II Stakes (Ascot) retained their names, others were given a change: the Diadem Stakes became the Sprint Stakes, the Pride Stakes became the Fillies & Mares Stakes and the Jockey Club Cup became the Long Distance Cup. The five finals were brought together at Ascot with the Balmoral Handicap to add something a little different, and the meeting has proved extremely popular with racegoers, punters and those in the business.